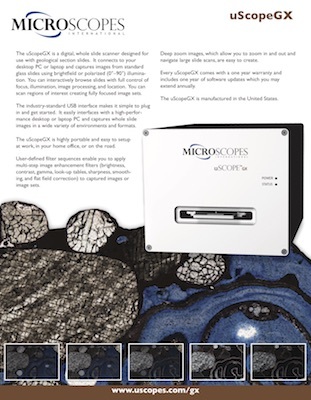 uScopeGX Model Comparison :: Microscopes Intl. 1 The uScopeGX is a dual-objective (brightfield/pol) whole slide scanner. Each uScopeGX model includes the specified objective (10x or 20x). Neither digital pixel doubling n interpolation are used to achieve the specified magnification. 5 The uScopeGX offers a number of different focus methods to accommodate a wide variety of specimen types and preparation. Specimens that are extremely thin can be scanned very well using predictive focus, fast stack, or even fixed focus. Thicker or inconsistent sections are best scanned with the exhaustive focus or predictive stack focus methods.